Perfect for any event or everyday use, illuminate your backyard, patio, gazebo, or use as a festoon to celebrate your wedding, anniversary, graduation in style. Impress your bistro, cafe, or party guests with ambience. 4. Do not exceed the maximum wattage of 960W when doing DIY connecting multiple string light sets. TRANSFORM YOUR BACKYARD INTO A BISTRO - Ideal for all outdoor applications, best decoration for an outdoor party, create a warm amber glow for your patio, garden, or gazebo. Professional planners request this outdoor lighting for anniversaries, weddings, holiday celebrations, and many other occasions. 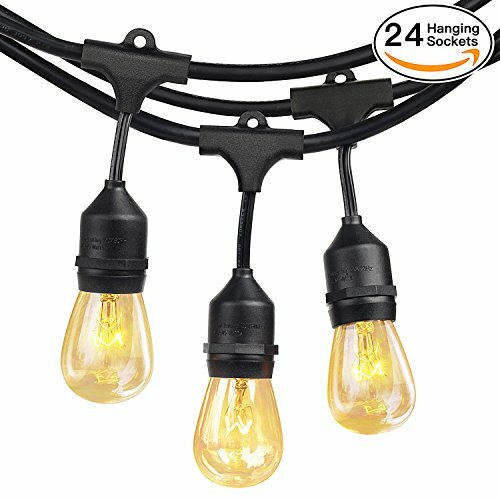 COMMERCIAL QUALITY AT A RESIDENTIAL PRICE - 48 feet black rubber weatherproof cord contains durable wire strung through 24 WEATHERPROOF light sockets, set about 2 feet apart. End-to-end connections, feel free to customize your arrangements. Heavy duty rubber construction throughout the molded sockets & integrated hanging loops. Compare to other hanging lights and see the difference in quality. DIMMABLE CAPACITY - Commercial strength casing designed to withstand the wear and tear of year-round outdoor use. Built with durable cord with weatherproof technology, illumines your landscape while layers of insulation protect the strand from extreme hot/cold temperatures and rainy, windy, or damp climates. Rubbery and flexible, it's much thicker than a traditional cord, so you can confidently leave this light string on display through summers and winters. EASY INSTALLATION - Use cup hooks, guide wires, or zip ties with the built-in loops to hang perfectly. 24 Clear 11-watt S14 incandescent bulbs are included on a 48 feet long heavy duty string. (2 free extra bulbs in the package as well for replacements. Connect up to 3 strings to enlighten any event and create a festive flair. Enjoy years of illumination at any venue indoors or outdoors with just a few minutes of installation.